The Skullcandy MacGyver MP3 Watch not only has possibly the coolest name ever for a watch, it puts up to 1 Gig of memory for podcasts and music on your wrist. 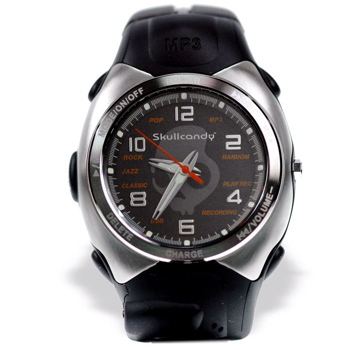 The Skullcandy MacGyver MP3 watch features a selectable 5-mode audio equalizer, 3-D stereo sound, music shuffle play feature, a built-in voice recorder and an integrated USB cable. The watch lets you listen to podcasts and music in MP3 and WMA formats, plus use the watch as a thumb drive to store and transfer other types of data files. The watch comes pre-loaded with Podcast Ready‚Äôs myPodder software, which lets you find, manage and listen to podcasts. Plug your Skullcandy MacGyver into an Internet-connected computer and you can access myPodder to update, subscribe to and manage your podcasts. ‚ÄúHaving Podcast Ready‚Äôs myPodder preinstalled on one of the coolest MP3 devices available will provide many innovators and trendsetters with access to Podcast Ready‚Äôs directory and management tools,‚Äù said Russell Holliman, founder and CEO of Podcast Ready. The MacGyver MP3 Watch is available in 512 MB and 1 GB versions.